The book is the first such extensive and comprehensive presentation of the Julien Bryan’s work. Its main theme is the siege of Warsaw by the German army in 1939, and most importantly - the fate of the residents of the Polish capital, as seen by the American photographer. 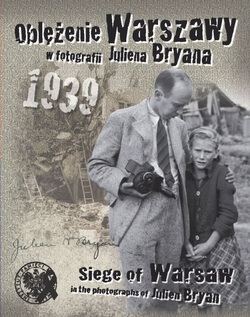 In addition to a wide selection of photographs, there are Bryan’s reportages, translated into Polish for the first time: Siege of 1939, and Warsaw revisited of 1959. We also present the accounts of Poles who helped Bryan:On the ruins of Praga,a radio speech given by Cpt. Władysław Polesiński and Warsaw in September with Julien Bryan,reminiscences of Stefan B. T. Radliński. Introduction by Jacek Sawicki and TomaszStempowski’s essay are a contemporary attempt to show the work of the American photographer in a broader historical context.